Once you have used the acclaimed Word Mail Merge feature over the course of your mailing duties, whether on a daily basis or infrequently – there is no turning back. Literally no other out-of-the-box Microsoft Office tool offers you so many benefits for mass mailing with so little mouse-clicking involved and with such vast improvement of almost every aspect of the resulting letters. Its renowned personalization possibilities utilize the so-called “macros” (a placeholder word that exists only to be replaced with an actual recipient-specific value from a data-source). The product’s versatility and overall ease of use has secured it a firm place among the top-flight productivity tools for professionals in the field. However, despite being a proven ally of many personalized mailing warriors, there is always space for more weapons on the rack. One such feature is the subject line customization, conspicuously missing in Word Mail Merge. While you can adequately solve this issue using generic subject lines, every now and then a significant benefit from personalize subject lines arises, as it will make the messages more attractive to end recipients, save you time, and, most importantly, ensure that the email catches the eye at a much higher rate. Who would ignore an email after seeing their unique and relevant data in the subject line? In other words, customizing your subject line in Mail Merge can enable a whole new layer of quality mass mailing – which is always handy, and sometimes critical, since in some scenarios a subject line is even more important than the body of the letter itself. The principle behind the subject line customization here is the very same that fuels the regular “merge fields” in Mail Merge – the macros! Basically – a mere pointer to some place in your data-source where a certain piece of personal recipient’s data is stored. Let’s explain the whole idea in the following everyday example. That’s it – the subject line customization is done! When the letter reaches the intended recipients, they will notice a refreshing change from the usual Inbox stream, and be surprised at the effort and care taken to discover a new customer. Primary goal is to personalize the subject line. Hello Phil, thank you for your question. This result is possible if your attachments are unavailable and you selected to skip messages if files can not be attached. Have you got a notification stating the files can not be attached ? In this case, please check availability of your files: if you use dasta source records where full file name is specified – please make sure file extensions are provided as well. 2. Click the “Start Record” button in the Problem Steps Recorder program, recreate the issue, and send us the resulting .zip file with the screenshots the program has generated. All the emails are stucked at the outlook outbox under “Sent” field with “None”. How can I resolve this? Hello, thank you for contacting us. 1. Please contact your Internet Service Provider (or, network/ mail server administrators) with the question if they apply any limit to outgoing mail: most of mail servers do have such limitations. a) Please run the “Compact now” utility in Account Settings-> Data File (if this option is supported by your mail store type) – that fixes issues with the mail store. Hi there, thanks for providing a perfect tool. I’ve downloaded it, but the add-in isn’t placed alongside its precursor, may I know what’s wrong? Looking forward to your quick reply, very urgent. Thank you. Hello Erin, thank you for your question. In Word/Outlook 2010-16: please point to File-> Options, highlight Add-Ins in the left block, then locate drop-down options in the bottom and choose “Disabled Items”-> Go. 3. If it is not listed among Disabled Items – please remove the tick from its check box in COM Add-Ins, click OK, then point back – and put the checkmark. Either add-in option will be added to the last mail merge wizard step (and on the ribbon), or you will get some informative notification. 4. If it does not appear even in COM Add-Ins – probably, you started the setup with Administrator permissions, and selected “Only for me” – so, the app is installed for Administrator only. Im still using the trial and would like to check with you before purchasing. I have several email account in my outlook; a personal email and team email. 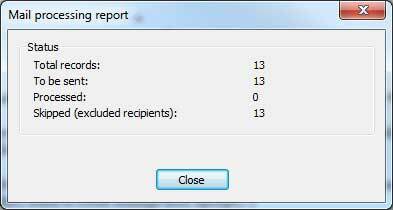 I would like to send multiple email through the team email to the multiple recipients through the mail merge toolkit. I have set the team email as default email, however, after mail and merge under mail merge toolkit, it is still send from my personal email instead of team email. Also, how long is the validity of each licence purchases? Hello JYLim, thank you for your question. Please test with the selection of the account manually. Sending through different accounts may depend on the mail server configuration. 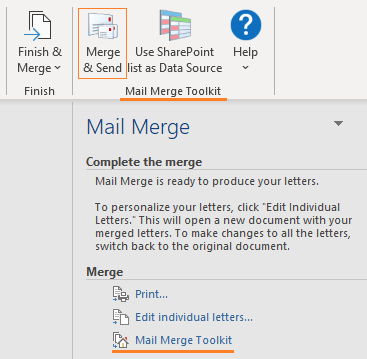 If you have several accounts in your currentle used Outlook profile, and get their selection while sending thought Mail Merge Toolkit (if “use default is disabled”) – our add-in will save your account selection in message properties. You can check that if you stop your outgoing mail: either click “Work Offline” on the “Send/Receive” ribbon, or disable “Send immediately is connected” in Outlook menu File-> Options-> Advanced-> and scroll to “Send and Receive”. Your messages will stack in Outbox, and you will see which account is specified there. If the account is correct, but messages finally are sent through another account – probably, your mail server administrators will be able to comment on this. If they conclude the issue occurs on our side – please contact us in our trouble ticket system with the details. >> Also, how long is the validity of each licence purchases? - or – to extend period for getting free software updates on advantageous terms, i.e. to renew the license for the 50% of the original license costs within the 13th month. I there! I’m currently using the free trial for the toolkit – will purchase when 30 days are up. However, I’m getting an error message when I try to finish the merge and send the emails. Is there something I can do to fix this? I’ve tried changing the format of the email, making sure my data file is accurate and working, rebugging the toolkit, but the same error message keeps popping up and I can’t send them at all. I followed your directions above. I got to step 4 and found no OutlookSenderAddin.dll file. There is nothing to select therefore I the enable button remains grayed out. I only have the option to close the resulting window. see picture support for comment ……………………………………………………………………………………………………………………………………………………………………………………………………………………………………………………………. 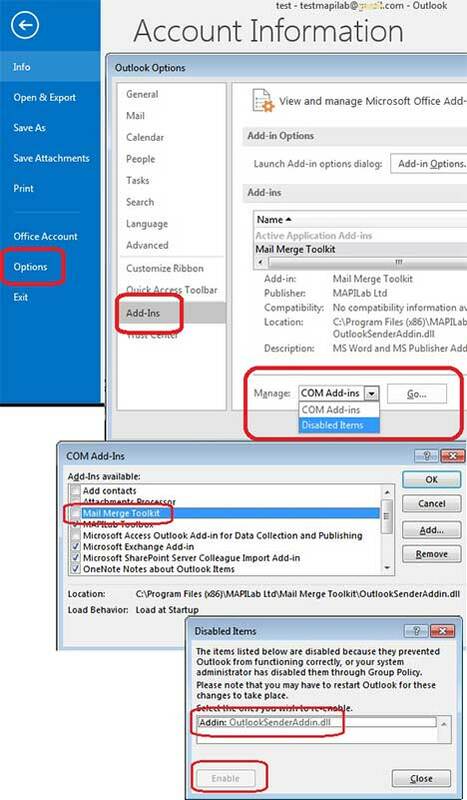 Please try deliberately de-selecting the add-in from the COM Add-ins window (use Step 6 for reference) first, restart Outlook, and then re-enable the add-in again. If this doesn’t solve the problem – please create a trouble ticket in our Support system, and we’ll provide you more detailed instructions. I’m looking at buying your mailmerge product. Can you advise if I can cc someone in a mailmerge that also has an attachment? Also is there a maximum number of people I can mailmerge? Hello David, thank your for your questions. CC-recipient will get a copy of the message addressed to the TO-recipient: e.g. if you have 10 recipients, and type nick-parker@mail.com to CC, Nick will get all 10 copies of personal messages to different recipients. e.g. a copy of your message to Mary will go to her teacher, a copy of message to Tom will go to his boss… Main recipients are Mary and Tom, and custom CC-recipients will receive their custom copies of messages to Mary an Tom, with custom attachments for Mary and Tom. Full registered add-in version does not impose any limit on the number of messages – it will generate messages for all TO-recipients (with CC-recipients if you need) and place them all to Outlook Outbox. Limitations may be applied here by mail server – ISPs often limit outgoing messages per hour or day, and you will need to elaborate this question by your ISP or administrators. The trial version of Mail Merge Toolkit will generate messages for 50 recipients from your list – and then correctly show its trial notification. i have tried this a few times, but in the emails it just sends out what is typed in for example the email received will have FIELD”First Name” in the subject line as opposed to the actual first name. Is there something that might be disabled or anything else i can try? Hello Dan, thank you for your message. That issue may occur if the field is used from the previous mailing and not refreshed. Please remove and then add the field to subject line before clicking on “OK” and starting mailing. 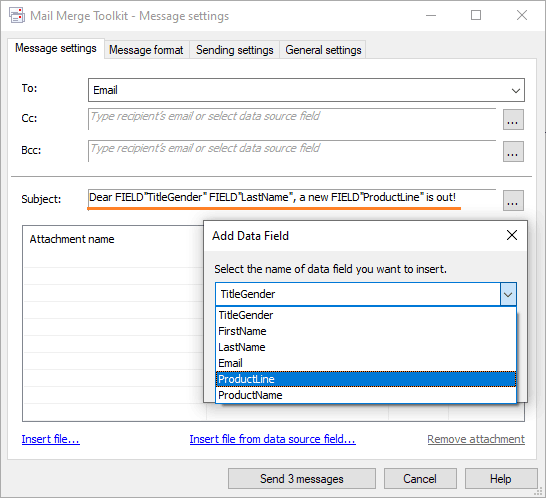 To exclude issue with connection ro the data source, please add that data source field to your document as well – and in the 5th step (Preview of the regular Mail Merge Step by Step Wizard), please switch between several messages, just to make sure the data is replaced correctly. You will be able to remove that field later before sending message. Hi! I purchased this and tried to use it for the first time but I encountered an error. Now I would like to do it again but the “Merge & Send” is not there. ps: you may need to enable the app in Outlook as well – the menus are just the same like in Word, component name in Outlook COM Add-Ins is “Outlook SenderAddin”. Do you have an example of how to do this using outlook contact fields? I have played around with it, but have not been able to make it work. Hello Dan, thak you for your question. We will be glad to answer all your further questions about our add-in. Thank you for your question ! Yes, please see in my screenshot: in the “Subject line” field, you can type your text, and also add your data fields from the data source – and custom values will be added to the subjects of your messages. Hello Brian, thank you for your question. Unfortunately, such nested statements are not supported in the subject line. If your recipients’ records in the data file contain either nickname, or firstname – you can add both fields to the subject: the add-in will paste the data from the field, i.e. if the field is empty – it will add empty value (space). We will apreciate your further questions. I’d like to use an if/or type solution in the subject field. If there is a nick name, use it, if not, use the first name. Is there coding to use this? I have it working properly in the body of the mail merge but cant figure it out for the subject line. Thank you! Is this product available for Outlook on Mac OSX? Hello Ben, thank you for your question. Our products are merely with the Microsoft software compatible (Windows OS and Microsoft Office for Windows…). We appreciate your interest in our software very much, but unfortunately, are not going to work on any software for the Macintosh company products within nearest future. We believe there should be similar solutions (produced by Apple or their partners) for the Macintosh software. However, I’m getting an error message when I try to finish the merge and send the emails. It says “The system cannot find the file specified” message along with an ERROR unable to send notice. Is this because I’m trying to use the toolkit for something that doesn’t come with the free version or is there something I can do to fix this? Hello Rea, thank you for your question.